The New Years Day race is a new fixture in the FFSC calendar and has been several months in the making. Sailors pre-entered in order to gauge the numbers and with good numbers registered the fate of the race lay in the hands of the weather gods. Come the morning of the 1st of January the Dinghy park was full of sailors and their boats. 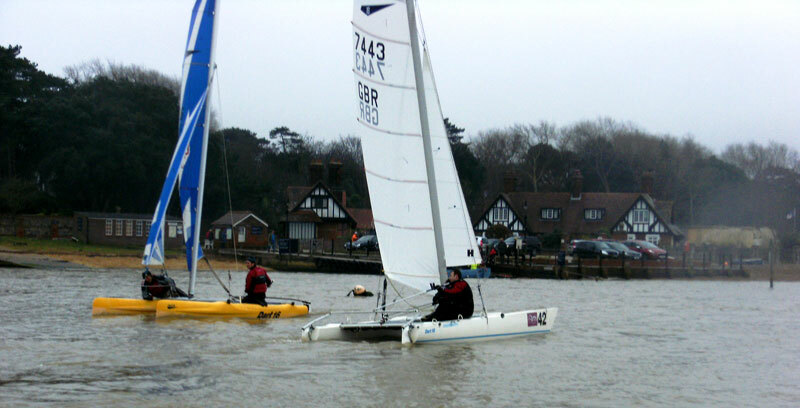 All the club boats were hired out as well as Laser 2000s loaned from youth sailing. 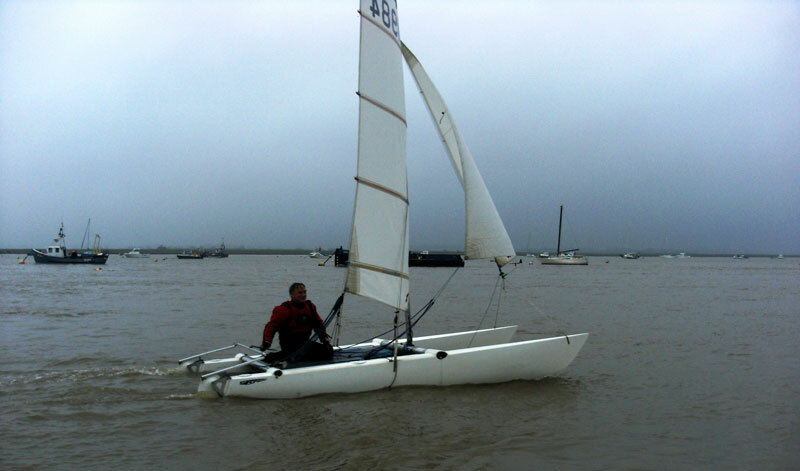 Tim O’Leary was race officer for the day and set a good course of two laps from Martello to Horse made harder by the incoming tide. At 11.30am the race began thanks to all the flag pullers in the crows nest. A bunch up at the port end of the line saw lots of shouting as people tacked out away from the metal piling on the Bawdsey shore and through the fleet of starboard boats who had started higher up the line. Standard tactics of keeping out of the tide was easy for the lasers but harder for the catamarans who saw any gains from their speed lost by longer tacks. First round the windward was Doug and Bev Chesterman in their Laser 2000 followed second by Tim O’Leary in the club laser, third by Sam Rowell and Sara Stones in their Dart 18. All boats round and back into the centre of the river to ride the tide up the river to Horse. 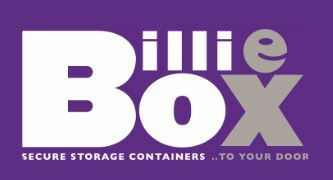 By the Leeward mark the top three boats rounded within a boat length of each other. 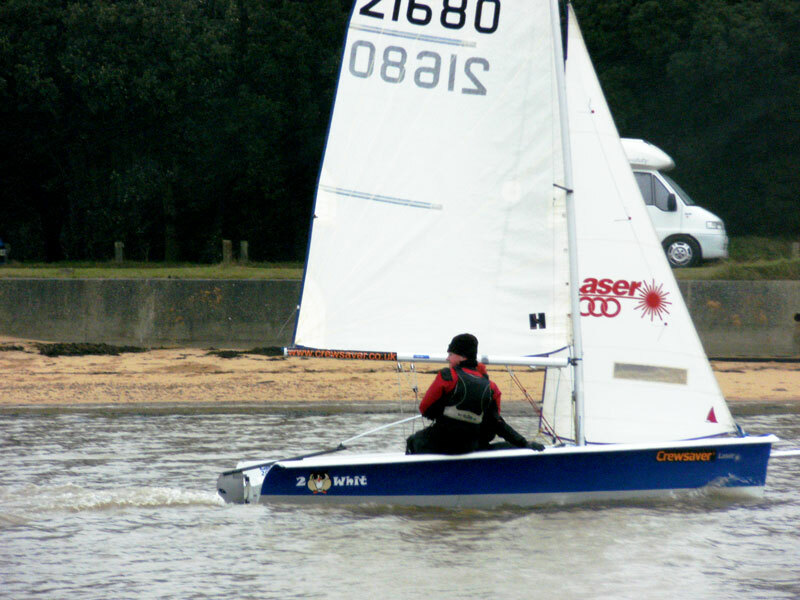 Somehow Nick Swain managed to plough the bow of his Dart 16 a few feet off the back of younger brother Ed Swains laser, taking the bottom few inches off Eds rudder blade. Family dispute later for sure. 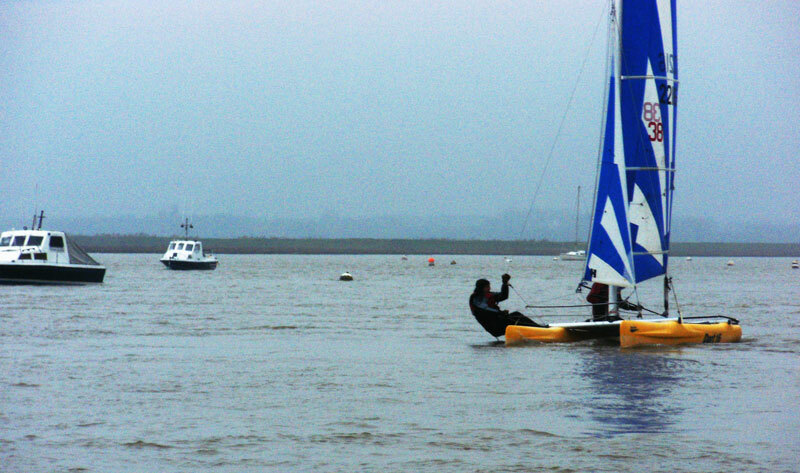 From here the slog began back up the river with several teams almost forgetting to leave the Bawdsey Inflatable mark to starboard on the upwind leg. 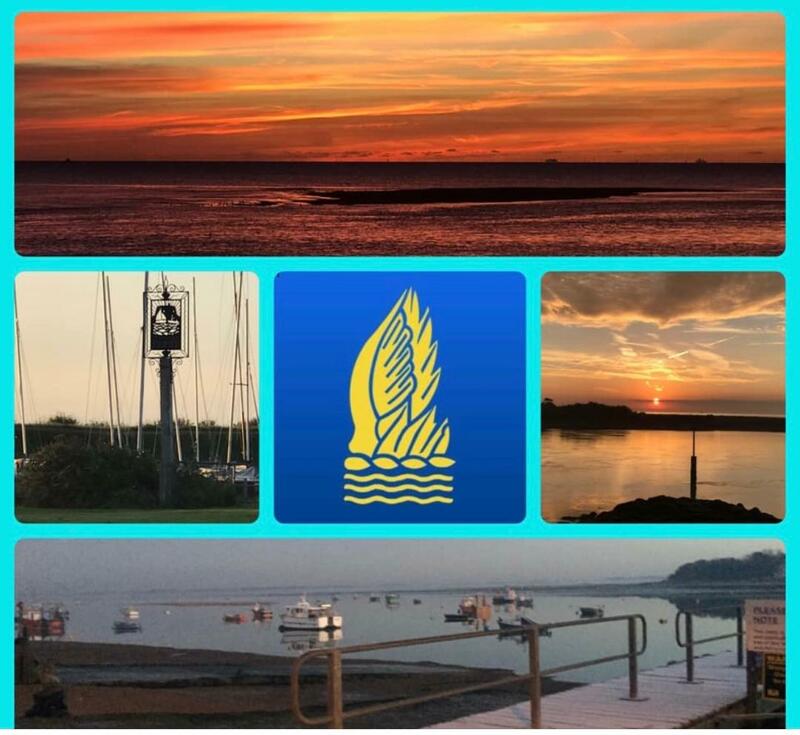 An event was taking place on the Bawdsey side of the river which meant the ferry was operational and full. With all teams hugging the seaweed strewn banks it was Doug & Bev and Sam & Sara who tacked feet away from the full ferry much to the delight of the crowd in the ferry and the queue on the Jetty. 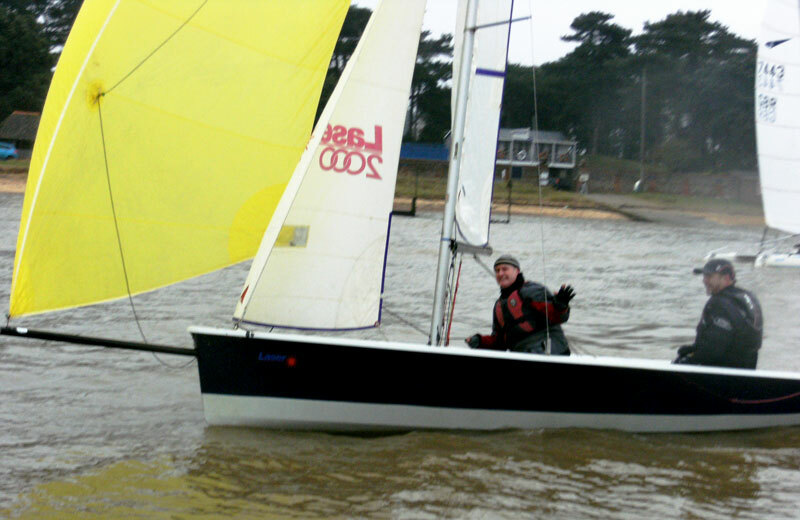 By the windward mark Andy Robinson and Chris Coe had taken the lead of the two Dart 18s. Sam & Sara later overtook but were then retaken later on. The monohulls were more nimble at hugging the banks and even after 40 minutes of racing the fleet were still within 50 meters of each other which on handicap meant the catamarans hadnt done enough to pull away. Paul Williams and Lucy Ellery had done enough though to pull through from barely being launched at the start to being the first Dart 16. In just over an hour the race was done and the slipway and beach were full of boats waiting to be hauled up. A packed bar saw the results posted and a special announcement to Ed Swain not just the winner of the New Years Day race but also receiving a trophy for last years racing series which Ed was unable to collect at the laying up supper. Well done to everyone involved and thank you to everyone who supported the race both in the crows nest, in safety boats and to all the sailors who braved the weather to kick off the 2017 season in style. 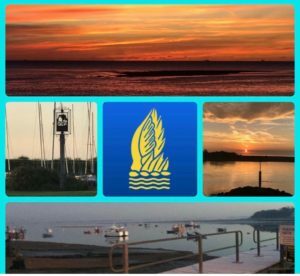 2017 should be a great year for sailing at the club and we look forward to repeating the success of the new years day race in 2018.